AEGEE (Association des États Généraux des Étudiants de l’Europe)   is one of Europe’s biggest interdisciplinary student organisations. As a non-governmental, politically independent, and non-profit organisation AEGEE is open to students and young people from all faculties and disciplines. Founded in 1985 in Paris, today AEGEE has grown to a Network of 13000 friends, present in 200 cities in 40 countries all over Europe. AEGEE strives for a democratic, diverse and borderless Europe, which is socially, economically and politically integrated, and values the participation of young people in its construction and development. AEGEE empowers students and young people in Europe to take an active role in society. It creates a space for dialogue and learning opportunities as well as acts as their representative towards decision-makers. Moreover, AEGEE strengthens mutual understanding and brings Europe closer to young people. AEGEE creates a space for members of different backgrounds to meet and learn about cultural differences, in order to foster mutual understanding. AEGEE supports mobility and encourages young people to cross borders and make new friends, to break stereotypes and strengthen tolerance, respect and solidarity. AEGEE provides learning opportunities for the development of its members through non-formal education and informal learning. By participating in trainings courses, workshops, and active involvement in the organisation, our members improve their competences (such as leadership skills, communication skills and team management) which will be useful for their future lives. Thematic projects, either local or international, are initiatives developed by members of AEGEE. They deal with current challenges in the European society, create awareness among young people and propose solutions from a student point of view. The outcome of this work has an impact in- and outside of AEGEE. AEGEE provides a space for young Europeans to discuss and exchange different points of view with a European perspective,in order to find a common ground. This exchange of ideas happens in all our activities but a special place for them is our Working groups, conferences and General Assemblies (EBM & Agora). The Summer University project aims to promote European integration. It is the main tool that AEGEE uses to attain this difficult, but fascinating target. 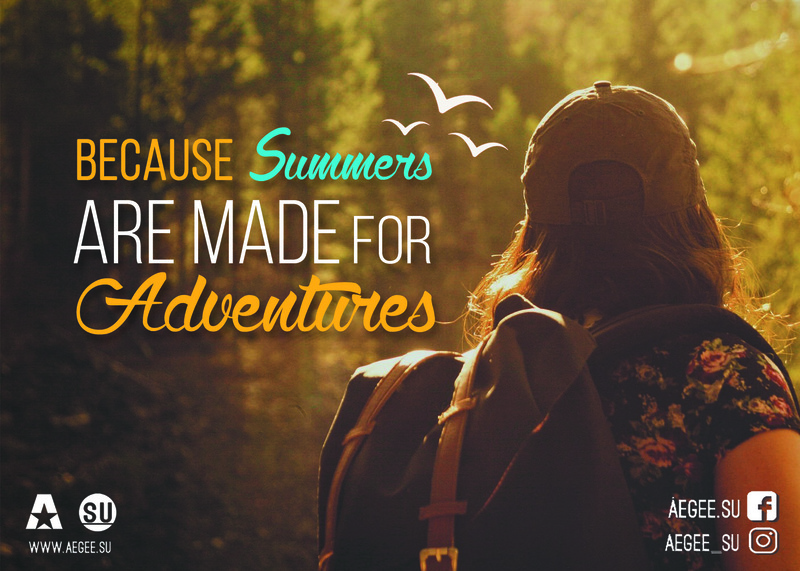 Summer Universities are events that take place during the summer in most of the cities where AEGEE is present, lasting between 1 and 4 weeks. Understanding and exploring the multicultural dimension of the European continent, tasting its diversity, removing national borders, fighting for tolerance and creating open-minded citizens are some of the reasons why 20 to 50 young Europeans from all over Europe come together for each Summer University. To promote the idea of active citizenship and youth participation in the Eastern Partnership program region. To advocate to stakeholders and governments for the recognition of the role that youth participation has in shaping a democratic society. To empower youth by providing it with knowledge and tools regarding citizens’ rights and duties. To build mutual understanding and trust between people from the Eastern Partnership countries and the rest of Europe. to strengthen partnerships and to share practices with youth organizations from the Eastern Partnership and other European countries. to promote the respect of human rights as crucial focus area in the consensus-building processes. to inform and to create an opportunity for discussion. The project was established to empower young Europeans to make a direct personal contribution to democracy in Europe as election observers. Organise observation missions to democratic processes taking place in European countries, offering young people the opportunity to be officially accredited election observers. Establish election observation as a standard for the internal democratic procedures of AEGEE-Europe. The project consists of many different parts, such as youth conventions, bus tours, training events and local activities throughout Europe. Furthermore, a special Voting Guide for young people is being developed that will be accessible online. For more information about each of these topics, please visit the relevant pages on the site and make sure you visit the site regularly to follow all updates. To create a pool of students who are knowledgeable about healthy lifestyle and its influencing factors, so they can implement the gained knowledge for their and others’ future benefit. The project aims to make students better informed about mobility programs and possibilities, as well as the benefits of these. Through the activities of AEGEE locals, the project team aims to increase the number of destinations and possibilities for mobility in universities inside and outside the current Erasmus zone, and lobbies in universities for implementing easier procedures and more clear guidelines for applying for mobility programs and respect the Erasmus Student Charter. Moreover, on the European level, Europe in Exchange lobbies for an adequate structure and funding of the mobility programs, including countries outside of the current Erasmus area. Established in 2012, the EuroArab project’s objective is to break down stereotypes and prejudices by bringing European and Arab young people together. AEGEE has worked for 27 years to do the same inside Europe; we believe that the time has come to go further- starting by European closest neighborhood In order to achieve that, we believe that the starting point must be- youth. By facilitating exchange between us, we will be able to establish closer ties to narrow the distance. The idea is to create increasingly stronger relations between Arab and European cultures. This is the key to the further collaboration that we hope will come from this project, and this is also what has definitely proven successful until now.